Two textile exhibitions were organised in the X Gallery between June and August. Magic of clothing accessories was an exhibition presenting unique clothing accessories from eight authors from Slovakia and three authors from abroad. It was the summary of the sector we hardly know about in real life: women hats, headbands, hair decorations, women handbags, belts, bags, scarves, ties and shoes. After three years in silence, the X Gallery revived the theme of textile jewellery in order to define the borders and present as various range of forms and trends as possible. 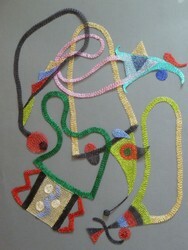 Alternatives of textile jewellery (until 25 August 2012) is an exhibition of 18 authors – 8 Slovak and 10 foreign authors. There are some unifying trends within different approaches to the creation of jewellery. Use of traditional textile techniques such as crocheting, knitting, bobbin lace making, weaving, felting and embroidery making was one of such trends (Blanka Cepková, Silvia Fedorová, Christine Keyeux, Flavia E. Michelutti, Ľubica Poncik, Blanka Šperková, Birgit Schlarmann, Dorit Schubert). Use of paper in jewellery design involving various processing techniques (Christine Keyeux, Elizabeth Krampe , Doris Schmitt) is another trend. Other authors apply the conceptual approach, examine alternative solutions, combine expensive and cheap materials and use recycled textile materials.